FOR the second consecu tive quarter in 2018, the global maritime report on piracy has put Nigeria on the spot, occupying number one position in the number of recorded attacks against vessels in the second quarter 2018, Q2’18. The first six months of 2018 saw a significant rise in the number of recorded piracy and armed robbery incidents in the Gulf of Guinea region compared to the same period in 2017. The Q1’18 report from the International Maritime Bureau (IMB) shows an increase in global piracy, with 107 incidents recorded in the first six months of 2018 compared to 87 in the same period in 2017. Most alarming is the increase in the number of incidents recorded in the Gulf of Guinea region, which has gone from 16 in the first half of 2017 to 46 in 2018, with 31 incidents recorded in Nigeria’s territorial waters alone. The report also says Nigeria, Indonesia, Bangladesh, Venezuela and Benin Republic led the table in the number of attempted attacks, number of vessels boarded by pirates, number of vessels fired upon, number of hijacked vessels and number of suspicious boats operated by pirates. A breakdown of the report further revealed that Nigeria recorded 31 attacks, closely followed by Indonesia with 25, while Bangladesh and Venezuela recorded 7 attacks each. Other are Republic of Benin and Ghana with 5 attacks each. vessels on anchorage, Nigeria led other countries with 14 of such attacks, followed by Indonesia with 11 and Bangladesh with 7 recorded attacks. Speaking on the development, Captain Jacob, Ovweghre, self acclaimed Director General of the proposed Maritime Security Agency, MASECA, said that the Nigerian Navy and the Nigerian Maritime Administration and Safety Agency, NIMASA are already over burdened with the problem of checkmating armed robbery at sea. Ovweghre disclosed that some of the pirates are not Nigerians adding that sometimes they are nationals of Cameroon, Ghana and criminals from other neighbouring countries. But in defence of the figure, Chairman of the Port Facility Security Officers, PFSO, Forum, Dr. Ignatius Uche, said that the measures put in place by the relevant authorities to checkmate the spate of attacks are yielding positive results as, according to him, ‘‘there has been a downward trend in attacks on vessels’’. He said despite the fact that Nigeria still leads the chart on piracy, the figure over the last three months has gone down. Former Senior Special Assistant to former President Goodluck Jonathan, Mr. Leke Oyewole, commended the maritime authorities for the measures put in place to reduce the activities of the marine criminals. Oyewole stated: ‘‘Whatever they are doing to reduce pirates attacks in Nigeria means that the measures are good and they must improve on them to further reduce the figure being quoted by the International Maritime Bureau, IMB.” Pirates and robbers were armed with guns in almost half of the Nigerian incidents and vessels were fired uponin eight of them. This current report is a confirmation of the trend in incidence of piracy in Nigerian maritime space. Worldwide, in the first three months of 2018, 100 crew were taken hostage and 14 kidnapped from their vessels. A total of 39 vessels were boarded, 11 fired upon and four vessels hijacked. IMB received a further 12 reports of attempted attacks. On the positive side, the IMB reports that the number of crew kidnappings has decreased globally from 41 in Q2’17 to 25 in Q2’18. 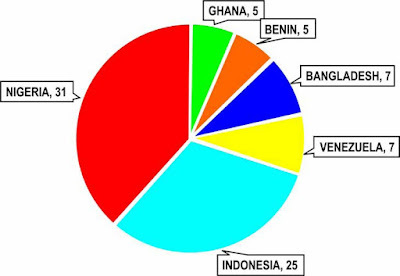 However, all 25 crew kidnappings reported this year are from six incidents in the Gulf of Guinea, off the coast of Nigeria, emphasizing even further the higher maritime risks in this region. Another positive development, however, is the IMB reports of fewer piracy and armed robbery incidents in piracy hotspots other than the Gulf of Guinea. For instance, no incident was recorded off the coast of Somalia in Q2’18 and while the number of incidents reported by vessels at berth/anchorage in Indonesia and Bangladesh remains high, the situation in the Philippines has improved. According to the report, abductions of crew from vessels in the Sulu-Celebes Seas and waters off Eastern Sabah have also improved, with no such successful incidents recorded in the first half of 2018. According to the Regional Cooperation Agreement on Combating Piracy and Armed Robbery against Ships in Asia (ReCAAP), the first six months of 2018 saw the lowest number of piracy and armed robbery incidents in Asia at that time of the year for the past ten years. 3 Nollywood Films Selected For Hollywood Screening In U.S.